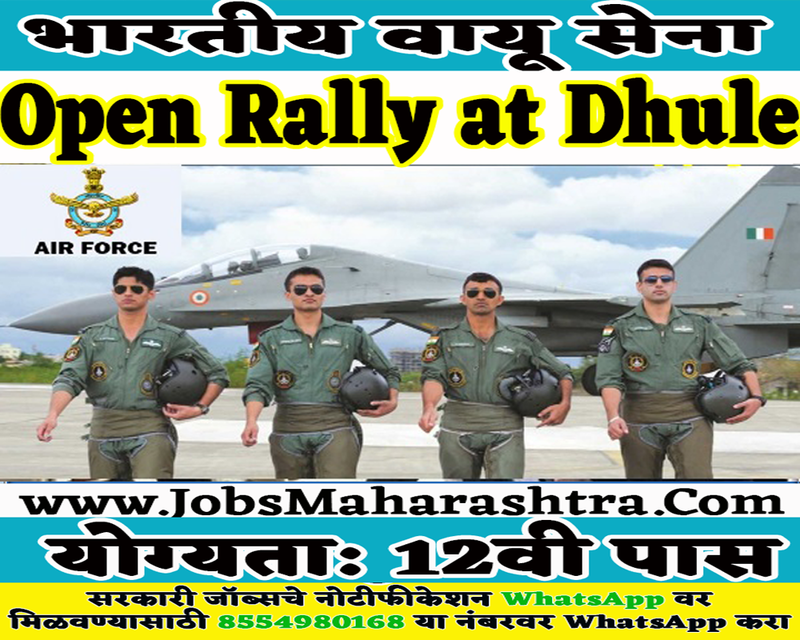 Here is the official notification for an open rally or recruitment rally of Indian Air Force for eligible candidates of 21 districts of Dhule, Ahmednagar, Aurangabad, Bhandara, Beed Buldhana, Chandrapur, Gadchiroli, Hingoli, Parbhani, Jalgaon, Jalna, Nagpur, Nandurbar, Nashik, Palghar, Raigarh, Sindhudurg, Wardha & Yavatmal at Dhule. 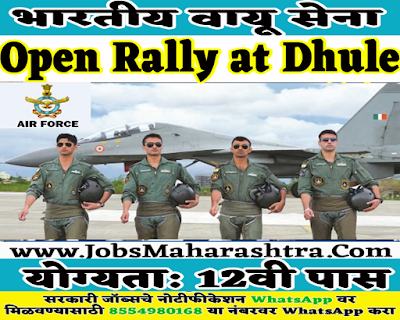 Detailed information and application links for this Indian Air Force rally was below provided. Age Limit:- Candidates born between 19 January 1999 and 01 January 2003 (both days inclusive) are eligible to appear in the Recruitment Rally. During training, a stipend of Rs. 14,600/- per month shall be paid. On completion of training the starting gross emoluments at the minimum of scale of pay including Military Service Pay shall be Rs. 26,900/- per month plus Dearness allowance (as applicable) which, in subsequent years, may rise as per the career progression of the individual. Special Force (SF) Allowance [IAF(S)] @ Rs. 17,300/- per month on completion of training shall be applicable to Indian Air Force (Security) Trade. Candidates should have passed Intermediate/10+2/Class XII or Equivalent Examination in any stream/subjects approved by Central/State Education Boards with minimum 50% marks in aggregate as well as in English in Class XII or equivalent examination. Candidates from designated districts of state of Maharashtra fulfilling the domicile requirements and eligibility conditions reporting up to 10 AM on 04 February 1019 at SRPF Ground, Near Surat Bypass Highway, Dhule, Maharashtra ( Rally Venue) shall only be permitted to appear in the Recruitment Test.